Philip sent us a great picture of his Beehaus this month. 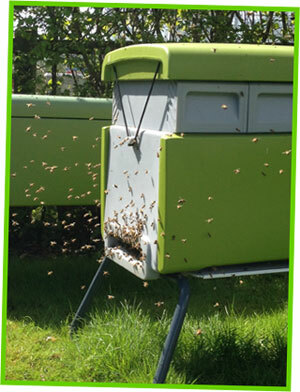 The green Beehaus is a buzzing hive of activity, with his year two colony hard at work, and we think they must be enjoying getting out in the sunshine after the rainy weather we had in early May. We love seeing photos of the Omlet products being enjoyed by people and pets, and uploading your pics to the website is easier than ever. Just find your product on the website and click on ‘Upload a Photo’. As long as the photo isn’t too dark or blurry we will use it on the website and pay you £1 for each one. If that wasn’t good enough, we will choose one photo every month to win a £50 voucher! So snap those eglus, aprons and egg cups and start earning some eggstra cash today! Upload a photo and win £50! Talking with Bees is a buzzing blog written by a man that thought beekeeping could be the key to sanity. It seemed to work for him, so if you want to give it a go, why not introduce your own Beehaus to the garden this Spring? Click here for more info! Buy your own Beehaus today for £499! It was National Honey Week earlier this month, and we missed it, doh! But we thought we’d have a bee-lated celebration with an offer on our delicious jarred honey. This week get 25% off the Cotswold Creamed Honey and Pollen Enriched Oxfordshire Honey and enjoy the sweet taste of honey at an even sweeter price. Honey is great on toast, in cakes and drizzled on your bowl of porridge, but a spoonful can also help keep the doctor at bay, because it can help to prevent hayfever. To get your discount, simply add your honey to your shopping basket and enter this voucher code: HONEYOFFER25 Offer valid until 31st May.